Last week, given the overall dismal state of my mental affairs, I decided I was long overdue for a yoga class. The last class I'd gone to was in York and I came out of it with a new way of thinking about my then-impending move. The instructor had focused the whole class around transitions and it left me with a feeling of ... maybe not peace with ... but at least in acceptance of the move. A month later, here we are. Moved. I found a studio that offered a class while Jovie was at preschool, so I went. Power I with Megan. The studio was much warmer than the classes I'd been going to. And the class was active. Like, Yoga as designed maybe by Tony Horton Lite. It was heavy on movement and sweating, and a little less focused on meditation. I spent some time in Child's Pose as the rest of the bendy, stretchy ladies around me powered through planks and Eagle poses. I'm probably a little out of shape. As we were going into half-pigeon, Megan reminded us to think about stillness. That because of the awkward nature of the pose, we often found ourselves wiggling and readjusting, when really we just need to stop and allow ourselves to stop moving and be still. Still. This word stuck out to me. I'd been sending my sister Laura long mopey texts about how tough it's been to feel motivated here. And how strange its been not having the girls at home. Lily is gone all day at school and Jovie is gone for three hours in the morning three days a week. Next year she'll be at kindergarten all day, too. I wasn't prepared for this transition. In York, Lily was going to half-day kindergarten. I've been home with them full time for five years now and I figured I'd have another couple years at least with at least one kid at home for most of the day. "Sue ... I think I have experienced this panic. It's hard to be still with yourself," Laura texted me. There's that word again. Still. And yes it is. We as a species are not particularly good at being still physically or mentally. Our culture doesn't value stillness. We value productivity and perseverance (especially if there's data to prove just how productive we are). But stillness? Stillness is almost a vice. Evidence of laziness or lack of drive. Like when we're not busy doing, we're just busy dying. As I settled into half-pigeon in that very sweaty yoga class, I got to thinking about stillness. I kind of yanked myself into the position and then started sinking. Trying to avoid excess wiggling and readjusting and fidgeting. I was still. But I noticed even in my stillness there was subtle movement. Not intentional on my part, just gravity slowly tugging me down further and further. And I thought about how stillness might not mean the absence of progress or change. Just a willful quieting of our bodies and minds. It's not as if we are ever truly still – our heart keeps beating, our neurons keep firing and my muscles (at least in half pigeon) keep shaking. The words still has multiple meanings. There's being devoid of motion. Uttering no sound. Free from noise or disturbance. But still is also used to describe the continuance of something. It's both ceasing and ongoing. So the stillness of right now, this small moment of my life, does not have to be about a failure to change or to grow – the real source of my panic. After my sister texted, I thought about the still things I know are forever changing. 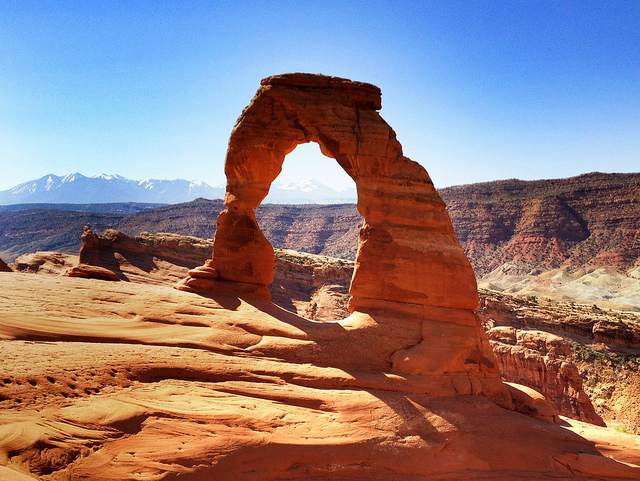 I thought about a trip to Utah I took years ago with my dad and uncle. There, we visited Arches National Park where millions of years of wind and rain have carved the desert sandstone into some of the most awe-inspiring landscapes you will ever see. Even those monolithic, seemingly immovable rock formations are ever-changing and impermanent. They, too, sink with the endless tug of gravity. The stillness of the arches allows us to admire the artistry of passing time, even as they're perpetually sculpted into something new. So here I am. All the mania and stress surrounding the move is slowly filtering away (well, sort of, the house goes on the market tomorrow, so that will add another level of nail biting and gastric discomfort and sleeplessness to the proceedings). Most of our things are put into their new places. The walls are still bare, but over time we will cover them. The house is becoming more lived in (i.e. covered in fur and figurines from various Disney Channel shows). We have new morning routines and new afternoon routines that are already starting to feel old. The system has been updated and rebooted and is now running along on its own. And here I sit at my old dining room table in our new, borrowed dining room. The girls playing on their own – one in the living room the other in the sun room. I can only hear them, not see them. The house is a traditional Colonial - divided and subdivided into neat compartments of activity. As if we live in a bento box. I will myself not to think about our cozy little house in York, where sometimes it felt like we could barely escape each other. As I sit here, I start to think. Even here, immobilized as I am by what was and what will be, I am being reshaped. And who that person will be? Well, I guess only time will tell.